Cabernet Franc is a red grape best known in France, where it is most commonly associated with Bordeaux’s right bank and the Loire Valley. Cabernet Franc is a parent, alongside Sauvignon Blanc, of the Cabernet Sauvignon grape, as well as a parent grape to Merlot and Carmenère. There are a large number of synonyms for Cabernet Franc, including Bouchy, Breton and Cabernet Frank. In comparison to the bolder Cabernet Sauvignon, Cabernet Franc wines tend to be of light or medium body, and are lighter in both color and tannin. The wines generally mature earlier. Cabernet Franc is sometimes associated with a herbaceous, almost green aroma, and possesses an outward expression of fruit. The red wines tend to be light in color saturation, well-structured and highly perfumed, with aromas of raspberries and red fruits. These are wines intended for early to medium-term drinking, and some of the best examples come from Anjou-Villages, Bourgueil, Chinon and Saumur-Champigny. Though mostly a blending grape in Bordeaux, Cabernet Franc plays a starring role in the Loire Valley. 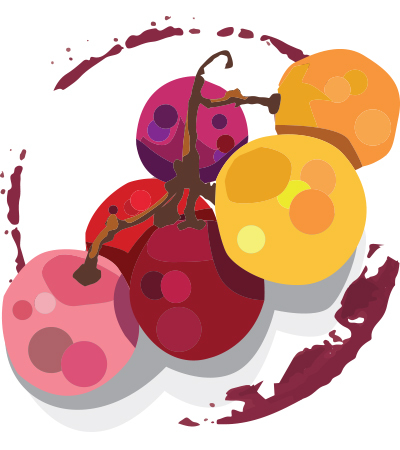 Its single-variety red wines are highly regarded, and the grape also features in rosé wines, like Rosé de Loire and Rosé d’Anjou. The region’s sparkling wine, Crémant de Loire, can also be made in part or entirely from Cabernet Franc grapes. In Bordeaux, Cabernet Franc is most significant on the right bank, particularly in Saint-Émilion. Here, it is used as a blending component alongside the dominant Merlot grape, usually in preference to Cabernet Sauvignon. Some producers favor Cabernet Franc over Merlot, and produce their wines primarily with Cabernet Franc. Elsewhere in the region, Cabernet Franc plays a smaller role and makes up only a small proportion of overall vineyard plantings in the Médoc and Graves regions. The grape ripens more easily than Cabernet Sauvignon, so many producers look at it as a sort of insurance policy against the kind of inclement weather that can cause problems for Cabernet Sauvignon. Beyond Bordeaux and the Loire Valley, Cabernet Franc is also cultivated in the southwest of France, including Bergerac and Madiran. Other significant plantings of Cabernet Franc can be found in Italy, notably in the Veneto and Bolgheri regions. Hungary’s Villány region produces some excellent single varietal Cabernet Franc, too. New world regions cultivating Cabernet Franc include California, New York, Washington State, Argentina and Chile. Canadian producers in the Niagara Peninsula produce premium ice wine from the grape. We invite you to use Wine Enthusiast’s online Buying Guide below to find top-rated Cabernet Franc wines and more information about this varietal. Peruse reviews by our expert tasters and articles to learn more and find your next bottle to try!